The refillable spray in its clutch 1. 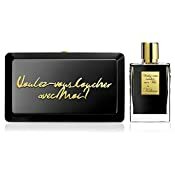 7 oz voulez-vous coucher avec moi is a caressing scent with a unique milky sensuality. Perfumer: alberto morillas. To protect his most feminine and iconic fragrances, kilian hennessy has created threepanions for a night that knows no bounds. Adoned with gold messages, these clutches turn into invitations for a night to remember!